Born in 1925 in the Kharkov province, Viktor Ivanovich Zaretsky – Soviet artist, educator, Veteran of WWII, a member of the Communist Party, a member of the USSR Artists’ Union, and public figure. Viktor spent his childhood and youth in Donbass in the workers’ settlements of Gorlovka and Stalino (now Donetsk). His father worked as an accountant at the then created chemical production. During the Great Patriotic War (1943-1945) he served in the reserve regiment, and after the demobilization lived with his parents for some time in the village of Obidimo near Tula, Russia. There he took private lessons from the Soviet painter L. Orekhov. In 1946 Viktor Zaretsky entered the art school at the Kiev State Art Institute, workshop of Gennady Titov. A year later he entered the institute, where his teachers were K. Yelev, M. Sharonov and S. Grigoriev. As an excellent student, he received Repin and Stalin scholarship. Besides, the diploma picture – “The Line to Lenin’s Mausoleum” – received the highest score. After graduating from the institute in 1953, Viktor Zaretsky began to teach in his Alma Mater. 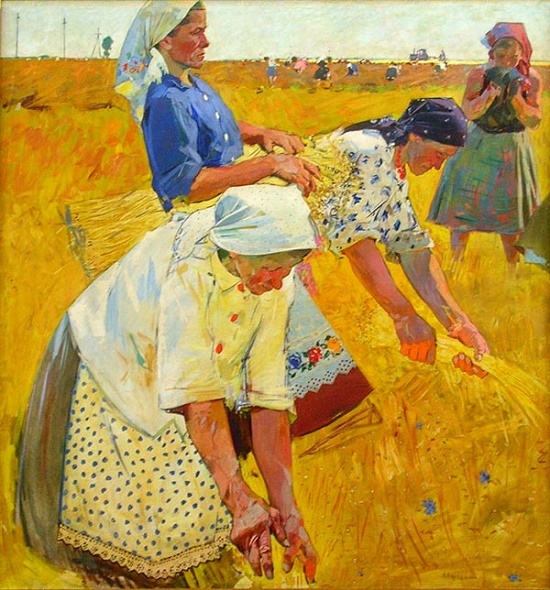 Since 1955, the artist worked in Donbass. There he created such paintings as “Miners. Shift”, “After the war”, “Hot day”, “Mine yard”, “After the change” and others. 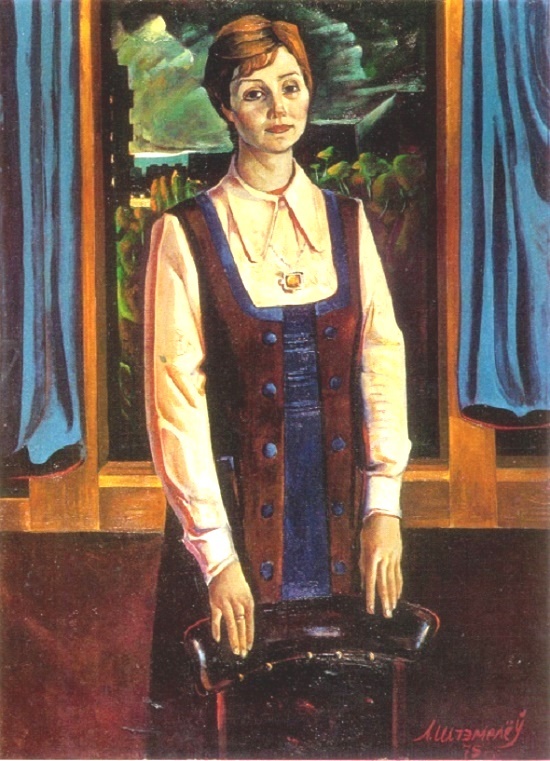 Born on November 18, 1906 in Vladivostok, Viktor Ivanovich Govorkov was a bright representative of Soviet Art. Member of the USSR Union of Artists, Honored Artist of the RSFSR (1971). Known, first of all, as the author of numerous propaganda posters on various themes. In particular, foreign and domestic politics, sports, fighting alcoholism and hooliganism. Worked in the field of journal and newspaper cartoons, and book graphics. Viktor Ivanovich Govorkov studied in Moscow VKhUTEIN from 1926 to 1930. Noteworthy, his teachers were prominent Soviet artists – SV Gerasimov, DS Moor and VA Favorsky. 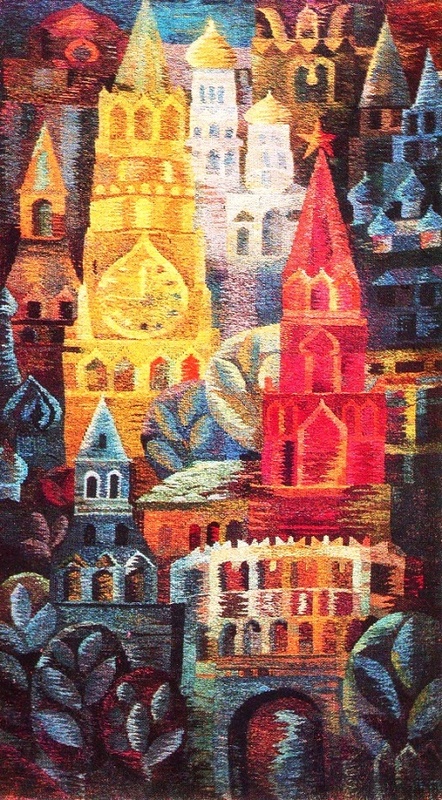 His thesis work was a sketch of a panel for the decoration of Red Square by May 1 (1930). Having started as a painter, Govorkov, however, later worked exclusively in book graphics and a poster. Originated in folk art, Soviet applied art flourished in the USSR, both in the midst of the people and among professional artists. Traditionally, every museum in every city had a permanent exhibition of unique works worthy of museums. In particular, porcelain and glass vases, ceramic and porcelain figurines and compositions. Also, textile art, popular and especially loved – tapestries and carpets, traditional elements of the Soviet interior. Meanwhile, the craftsmen paid special attention to improving the artistic quality of mass household items. In the field of ceramics, many Soviet artists have successfully worked in Russia, Ukraine and Georgia. Exhibitions of Soviet decorative art certainly included the best examples of art glass products, artistic carvings on the bone, embossing on the skin and jewelry. A special place in the Soviet arts and crafts occupied the lacquer miniature, Palekh, Kholui and Mstera. In addition, embroidery and lacework. Also, the finest carved articles made of bone, an expressive small sculpture made of bone, horn, stone, etc., created by the Kholmogorsky, Tobolsk, Chukchi and other masters. Born 2 June 1925 in Moscow, talented graphic artist Dmitry Krasnopevtsev was a representative of “unofficial” Soviet art. Besides, one of the most significant representatives of Soviet nonconformism of the second half of the twentieth century, and the Second Russian Avant-garde. His first works date back to the post-war era, and the style that made Krasnopevtsev a truly original artist was formed by the early 1960s. Characterizing this style, critics use the term “metaphysical still life”. He began his studying fine arts in 1942 in the Moscow Regional Art College in memory of 1905. However, in 1943, like many of his contemporaries, he had to to go to the front. After the WWII ended, he graduated from college. Then he worked as a drawing teacher in high school, and in the period from 1949 to 1955 he again studied, but already at the Moscow State Art Institute of VI Surikov. Born January 1, 1942 in the village of Khvostsovo, Vladimir region, Rudolf Nikolaevich Baranov is a Soviet Russian monumental artist, painter and teacher. Member of the Union of Artists of the RSFSR (1976). First he received art education at the Palekh Art College of the lacquer miniature of Maxim Gorky (1959-1964). Here, his teachers were such Soviet artists as N. Zinoviev, B. Nemtinov, V. Astakhov and P. Korin. Next, studying at the Surikov Art Institute, he turned into a great master of painting with an individual creative handwriting. Merchant Samara, where he still works, Volga, family, people of intelligent work – this is the soil that feeds the creativity of Rudolph Nikolaevich. In 1971 he graduated from the Faculty of Monumental Painting of the Moscow State Art Institute of Surikov (teacher KA Tutevol). 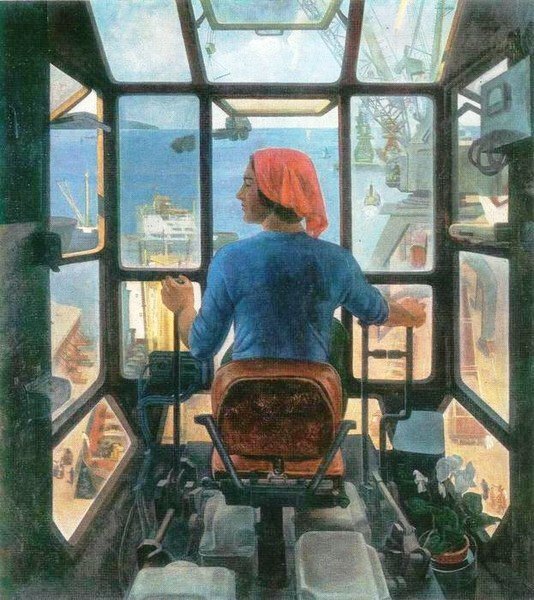 Noteworthy, his first diploma he received from the hands of prominent Soviet artist Nikolai Tomsky for the painting “From the height of the port crane” (1974), which became a classic of Soviet art. While still a student, he worked as an artist decorator in the theater of Vakhtangov. Meanwhile, in 1971 he came to Samara. Repeatedly, he was a Chairman of the Board of the Samara Regional Organization of the USSR and Union of Artists of Russia (1981-1985, 1998-2010). In addition, he taught at the Kuibyshev Art School and the Art College of KS Petrov-Vodkin (Samara). Since 2006 – Professor of Samara State Architectural and Construction University. Born February 5, 1923 in Vitebsk, Leonid Dmitrievich Shchemelyov turns 95 years old this year. He is one of the greatest masters of Belarusian fine arts, a teacher. People’s Artist of the BSSR (1983), Honored Artist of the BSSR, and laureate of the State Prize of the BSSR (1982). Being a native of Vitebsk (1923), most of his life he lives in Minsk. In 1959 he graduated from the Belarusian State Theater and Art Institute, painting department. From that time up to now, Shchemelyov is a participant of almost all Belarusian republican exhibitions. 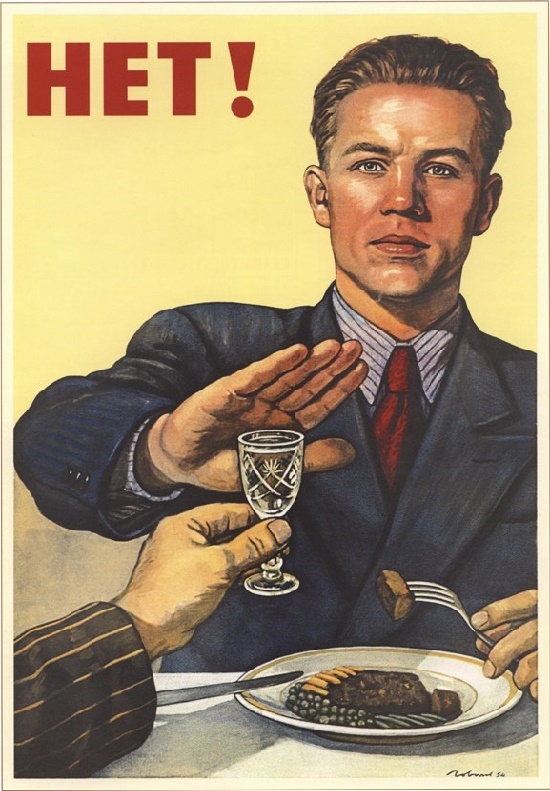 Also, exhibitions of Soviet art in the USSR – RSFSR, Lithuania, Uzbekistan, Ukraine. Besides, his works appeared in the exhibitions of Soviet Belarusian artists abroad. In particular, in England, Austria, Algeria, Angola, Bulgaria, Hungary, the GDR, West Berlin, Italy, Canada, Mexico, Poland, France, Germany, Czechoslovakia, Sri Lanka, Yugoslavia, and Japa. 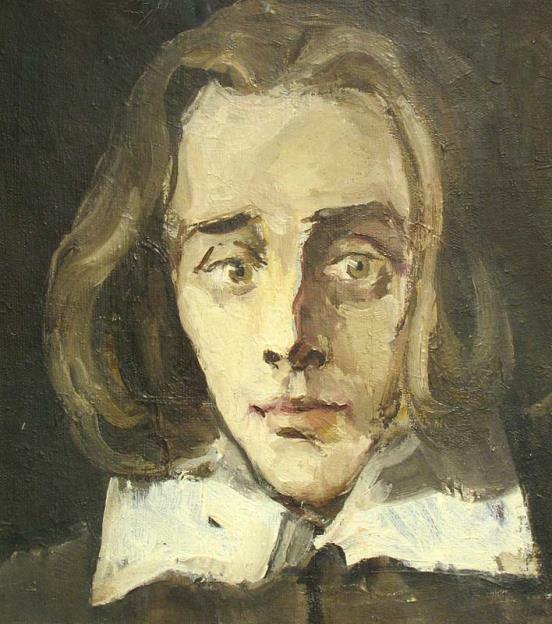 Born on January 2 (14), 1893 in Moscow, Vasily Nikolayevich Yakovlev was a Soviet painter, People’s Artist of the RSFSR (1943) and Laureate of two Stalin Prizes (1943, 1949). The boy grew up in a wealthy merchant family. Since 1911 he studied at the Physics and Mathematics Faculty of Moscow University, simultaneously visiting the art studio of VN Meshkov. Just before the Great October revolution, in 1917, he graduated from the Moscow University of painting, sculpture and architecture. In the university, his teachers were famous Russian artists Konstantin Korovin, AE Arkhipov, SV Malyutin, and others. Vasily Yakovlev taught at VKhUTEMAS (1918-1922), at Moscow Institute of Arts (1934-1936), and Moscow State Institute of Architecture and Art named after VI Surikov (1948-1950). And in 1922 he became a member of Union of artists of Revolutionary Russia (AHRR). 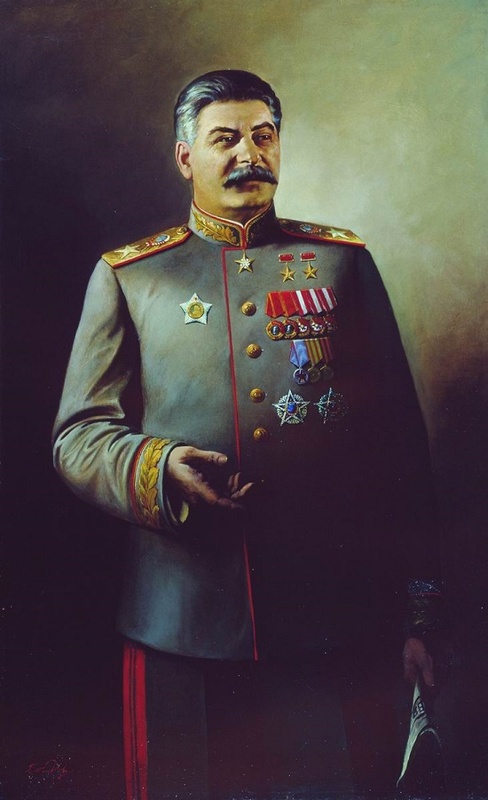 After the great Patrotic war, in 1947 he became a full member of the Academy of Arts of the USSR. From 1926 to 1932 he worked as an artist-restorer in the Pushkin Museum of Fine Arts. Besides, since 1930 he was in charge of the restoration department. In addition, in 1938-1939 and 1949-1950 served as the main artist of the All-Union Agricultural Exhibition. Yakovlev proved his high official status with heroic portraits of the period of World War II. Also, the artist enthusiastically acted as a teacher. In particular, he taught since 1918 in the Free Art Studios, the Surikov Institute and other colleges.